Last Christmas I spent some time studying Mary, the mother of Jesus, in the scriptures. I recently came across the notes I had made from that study and was impressed by 1) what I had been taught and 2) how I have not been diligent in implementing those insights. After an awful parenting day yesterday, I really need to readdress this and recommit to giving my children my very best effort and then some. After all, their precious, innocent souls should not be scarred by my imperfections. Mary was thoughtful in gathering information about Jesus’ life and making connections about who he was and what he needed. I feel such a weight of responsibility and expectation to do right by our kids, to not mess them up and to help them reach their potential. I cannot even begin to imagine who much more the calling of motherhood weighed on Mary as the mother of the Savior of the world. When Jesus asks the question “How is it that ye sought me?” I always read that as asking why. Why were they looking for him. He was doing his Heavenly Father’s work by preaching in the temple and clarifying the gospel. But this time “how” struck me as the method. Was Jesus in fact asking them how they were looking for him? Was it through prayer, faith and the guidance of the Spirit? Was it only with the natural man’s ability to reason search and find? Maybe they were or maybe they weren’t using prayer and faith and the Spirit to find Jesus and it still took them three days. But thinking of these questions led me to ask myself a game changing question: How am I seeking my children? Am I using the Spirit to understand their eternal nature and destiny? Am I pondering in my heart their personalities, preferences and emotions? Am I asking in faith how to meet their needs? Am I pleading for strength to overcome my own weaknesses, specifically to better my parenting? At times when I am really in this frame of mind I don’t get so impatient so quickly. I act from a place of love and compassion. But far too often I sound more like Mary’s question “Why hast thou thus dealt with us?” I get caught up thinking that my children’s behavior is them trying to make my life awful. The reality was that Jesus had a God-commissioned work to do and needed to get it done. So do our children. I pray I don’t stand in the way of my children reaching their potential. How are you seeking your children? Photo is the painting Mother’s Love by Del Parson found here. P.S. 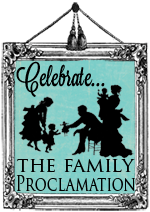 I’m really excited about the annual celebration of The Family: A Proclamation to the World that is happening at some of my favorite reads for the next two weeks. I have a couple posts lined up to contribute to their blog hops that I’m excited to share. P.P.S. 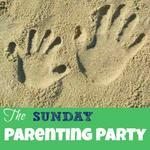 I’m linking this post up with the Sunday Parenting Party at Play-Activites blog. I have a special treat to share. We are in the process of reviewing (i.e., falling in love with) the new CD La Bella Stella from Recess Music. It’s the latest in Recess Music’s series Celebrate Earth. I’ll share our review and the fun we’re having with the album closer to its March 27, 2012 release. Today we are privileged share our email interview with Recess Music’s founder and CEO, Nancy Doan. I’m inspired by her story and how she used her talent to add value to the music industry and the lives of our little ones. BBGU: How did music become important in your own life? Nancy Doan: For as long as I remember I have loved listening to music. My earliest music memories are staying at my aunt and uncle’s farm, eating breakfast in the kitchen with the radio playing the hit songs of that time. Musicals from the 30’s and 40’s on TV also were also a favorite. Fred and Ginger, (Astaire and Rogers), were something to behold! The musical interest of my life was set! BBGU: Why was it important to you to pass music onto your children? Nancy Doan: I wanted my kids to hear music that I considered part of our musical heritage as a country… Oh Susannah, Home on the Range, I’m a Yankee Doodle Dandy as examples. Also, music from the “Great American Songbook”, like In Your Easter Bonnet, White Christmas, Catch a Falling Star are special to me and I wanted my kids to know them. They were happy, uplifting, and easily sung in the car. BBGU: How did you feel when your children wanted to pass your love and their love of music on to their own children? Nancy Doan: How great is it hear your kids talk about something that was meaningful in their childhood? That they want to pass the same experience on to someone else? How happy that made me. Those years of being the taxi service to dancing, gymnastics, school games and events, etc, etc, etc, actually served a purpose. Clearly, we built family memories. BBGU: How did the Celebrate Earth series come about? Nancy Doan: My first music compilations were done just to share with my kids and contained the music they remembered from childhood. Then I did compilations for my best friend’s parents. They were elderly and on a very fixed income. I made sets of albums which contained all “big band” music from when they were young adults, during WWII. They were so excited and expressive about the joy they felt when they listened to “my music”, as they called it, that was a special moment for me. I had found something that I could do for others that added joy. I wanted to find a way to do that for other people and especially kids, like my own. I was also becoming “green” in my life and I thought, “What a great way to add joy to kids lives as well help them look outside of themselves for meaning as well. The idea of the Celebrate Earth Music Series was born. BBGU: I’d love to hear your thoughts on using music to teach children. Please share! Nancy Doan: Studies about the impact of music on people of all ages are many. Music therapy is proven to benefit people. Children love to jump, clap, dance and wiggle to the beat of music. Don’t we all? We remember music experientially, relating it to times and events in our lives. Music carries meaning. We have music to teach the ABC’s, music about the itsy bitsy spider for teaching finger play, music that celebrates “America the Beautiful”, that we share nationally. Music is a good tool for conveying thoughts, ideas and information…including ideas about taking care of our planet. BBGU: How do you envision families receiving and acting on the music and message of the Celebrate Earth series and specifically La Bella Stella? Nancy Doan: When I began to work on La Bella Stella, I remembered being very young, in my room at night, where my bed was placed close to the window. I loved laying in bed and trying to count the stars, looking at the moon and making hand shadows on the wall using the moonlight. While creating the La Bella Stella album I thought of children doing the same thing in their beds, looking at the same moon, counting the same stars, or searching for the big dipper. I like to think of parents taking their children out on a beautiful summer night, laying on the grass in their yards, and together counting the stars, looking for the man in the moon, and talking about traveling in space. Something as simple as that will be remembered by their children for years to come, just like my kids remember us singing together in the car. Thank you so much, Nancy for your time and for sharing your passion about enjoying our Earth, protecting its resources and teaching our children to do the same. The theme scripture for Primary this year is found in Joshua 24:15. We plan on memorizing the scripture. In preparation, I thought I’d print up the words, but I got a little carried away and made these cute posters, instead. If you click on the picture you’ll get the big version to download. Enjoy! I’ve always been drawn to the performing arts. I don’t have a great voice. I’m not gifted at playing a musical instrument. I’ve dabbled in drama, but nothing serious. And I’m quite the laughable sight on the dance floor. Despite these shortcomings, I still appreciate the performing arts. Having tried (and found my skills lacking) I know how difficult it is to do it well and that helps me appreciate great performances all the more. I’d love for the girls to become great pianists with amazing voices that can wow and inspire on the stage or the dance floor. But that needs to be their choice when they’re ready to make it. For now, though, I can share my love of music, drama, and dance with them and help them see the beauty, the comedy, the inspiration, the joy that comes from the performing arts. Why Are the Performing Arts Important? Funding for arts in education seems to be at the top of the “Can’t Afford It” list every year. It begs the question, if it’s so easy to cut funding for it, does it really matter? YES! It does matter. And making it part of their early childhood education can help them to have an appreciation for performing arts as they get older. Math, Science, English, History all serve their purpose in the basic knowledge we need to get educated. But appreciating and participating in the performing arts adds another dimension to life. We become well-rounded citizens when we allow the performing arts into our lives. We are inspired, uplifted, moved to better ourselves, our families and our communities. There is joy in living when we allow ourselves to be entertained in wholesome ways. Appreciating the arts in general, and the performing arts specifically for this post, has always been a sign of advanced civilization. I’ve been thinking about that a lot and trying to find my own understanding of that classification. It reminds me of Maslow’s hierarchy from Psychology 101. If all of our time and energy is focused on meeting our physical needs for food and shelter then there’s no energy left over for emotions or relationships and thus definitely no energy left over for participating in wholesome entertainment. When basic needs are met easily and there’s energy left over, then we can focus on relationships, improving ourselves, understanding the world around us and appreciating or participating in the arts. So civilizations or groups within civilizations that have an abundance of resources have the energy and time to devote to appreciating the arts and, if they chose, participating in them. From my experiences and observations, it seems that most people have some desire or drive to create something that inspires others. It can be anything from a lullaby for a baby, to a letter-craft for a preschooler; an impromptu band with friends to an comedy routine at a family or neighborhood talent show. Exposure: They need to see the performing arts in action. Take them to see dance groups or music groups perform locally. Get season tickets to a children’s theater (one of my favorite memories from my elementary school days). Many communities offer free events at the park during the summer months. Chance to Participate: You can enroll them in dance classes, art classes, music classes. There are many resources for mommy and me classes (in larger communities) If those things aren’t available, make some instruments at home, crank up a CD or the radio and dance around. Act our your little one’s favorite episode of Dora (or their favorite show or book). Making the performing arts a part of their lives now will help them in so many ways. They’ll develop confidence in themselves as they perform (even if it’s just for you) and they’ll see the joy that comes from this medium of entertainment. They’ll make connections between their experiences and the culture in which they live. They’ll have knowledge that is shared among their community and society, helping them find ways to interact in new situations. What other benefits do you see from helping your little ones appreciate the performing arts? I’ll be talking more specifically this week about music, drama and dance and how to help your little ones appreciate these modes of entertainment, both as a spectator and a participant. Be on the lookout for a sweet giveaway this week, too. Thanks to everyone who entered the Get Waussified Book Review and Giveaway. And a special welcome to all the new subscribers and Facebook Fans! The winner, chosen randomly by Random.org, was comment #7: Sarina of Starting to Save. Congratulations, Sarina! I’ve sent you an email, please respond as quickly as possible. Thanks! The Waussie Books are now available in the US and can be found on Amazon.com and at prominent bookstores. Welcome to another contribution to The Adventure of Motherhood’s Feed Me Books Friday. Today I’m excited to share a series with you about some Wacky Aussies. The author, Jacqui Taub, has offered to send the complete series to one lucky winner! There are six books in the series. We’ve rad and enjoyed them all. Each one comes with a CD that contains the Waussie Song and a dramatized reading of the book. Each character has a different voice which I think enhances the listening experience. Sammi loves to listen to the CDs while looking at the books and often prefers to hear them rather than to have me read them. Beach Ball Waussie invites Hiccup Waussie to jog with him to help his breathing. Ant suggests blowing up balloons the keep the air out. Overall, I think these books are really fun. The characters are unique and captivating. Sammi is having a lot of fun recognizing the characters again in each book. Jacqui has created a great community of friends and you feel a part of that community as you read the books. The lessons they teach are subtle so it’s not too preachy, but they make for great discussions as you help your little one draw the lesson out of the story. Aside from her own grandchildren, Jacqui has worked with children and loves the interaction of being with little children. This love is evident in her books and CDs. We were surprised when the CD reading of the book didn’t have a ding to say when to turn the page. That was a little difficult when in the car because we couldn’t see the pages to help Sammi. But when we cuddled up on the couch to listen, it definitely kept us both engaged in the story and the experience of reading together. When I asked her about it, Jacqui said she left it out intentionally because “it’s more encouragement for mums to sit with the children and help them read along.” I was definitely encouraged! The giveaway os for a complete set of Waussie books from Waussie Productions and Jacqui Taub. This giveaway is open to US residents. The giveaway will run until March 18 11:59 EDT. The winner will be announced Friday morning and contacted via email. Feel free to do as much as you’d like to gain extra entries in the giveaway. You can use Twitter and Facebook once a day for additional entries throughout the week. Please come back and tell me each time to claim your entry. Leave a comment telling me how you teach values to your little ones. Please leave a separate comment for each entry to make sure all your work is rewarded. Visit Waussie Productions and watch one of Jacqui’s videos. Leave a comment saying which video you watched. Thanks for entering the giveaway! Don’t forget to check out other books moms are recommending over at Feed Me Books Friday. Disclaimer: I received the complete set of Waussie books to aid my review. My opinions are my own and reflect the experience my children and I had with the books.